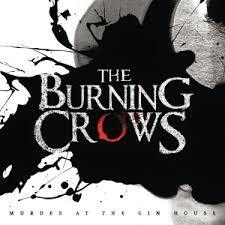 Share the post "Album review: THE BURNING CROWS – Murder At The Gin House"
This is the second album release from The Burning Crows and on listening it would appear that the band are developing nicely. The thing which impresses here is the advanced song writing skills on show, there are some great numbers which are well constructed, there is even the odd bit of orchestration going on. In fact the song ‘Goodbye’ is a big ballad very much in the Aerosmith vein, frontman Whippz may not possess Steven Tyler levels of vocal dexterity but he is well up to the job. It’s not all about the ballads though as the guys also have the ability to produce polished melodic rock with a harder edge. Songs like ‘Shine’ and ’11.37’ come across as a mix between the afore mentioned Aerosmith and a touch of Bon Jovi but The Burning Crows have made sure that they firmly stamp their identity on there as well. The melodies and harmonies are spot on and the hooks and choruses are memorable and will have you singing along within a couple of listens, always the mark of a good song. This entry was posted in ALBUM REVIEWS, ALBUM REVIEWS (Mobile), All Posts and tagged Aerosmith, album, AOR, Bon Jovi, CD, Murder At The Gin House, review, rock, The Burning Crows, Whippz. Bookmark the permalink.